Continue reading "How to retain employees at your manufacturing company"
What happens when you need to close a plant? How do you take care of your employees? The economy has caused a number of problems for businesses and many manufacturing plants have been forced to close some of their locations. Letting go employees can always be a bit of a challenge. How do you take care of all those people that worked so hard for your company? Here are some effective ways in which you can let people go without making it seem terrible. Continue reading "What happens when you need to close a plant? How do you take care of your employees?" When employees stand for 8-10 hours or more a day, it can lead to blood clots and other health issues. To help reduce leg fatigue, back aches, and other issues you can use floor-mats that help to reduce leg fatigue. Anti-fatigue floor mats aren't that expensive and they can easily transform hard tile into soft flooring that is easier on the legs, back, and joints. Continue reading "Reduce employee fatigue with floor-mats and other easy tools"
Thousands of manufacturing facilities have turned to Six Sigma as a way to reduce errors and waste. They often see that implementation of Six Sigma yields higher profits, happier employees, and a healthier company. One method in the Six Sigma process is known as DMAIC. This method helps you draw out the defects in your manufacturing process so you can start saving money and getting rid of waste. Continue reading "Using the DMAIC method"
Continue reading "Safety regulations you need to focus on in the workplace"
Waste reduction and the removal of unnecessary process can save companies millions of dollars a year. Lean manufacturing benefits not only the company but the consumers of the products. The customers get to enjoy increase value to their products while the employees appreciate their jobs do to the incentives and motivational tools used to make the working environment flow better. The purpose of lean manufacturing is to reduce cycle times and get the products to the customers faster than anticipated. Continue reading "Why you need lean manufacturing"
Total Quality Management (TQM) helps to improve product quality using a long-term approach at improving production and customer satisfaction while decreasing wastes. TQM has been around for 60 years now and it continues to grow strong alongside Six Sigma and other process improvement strategies. Continue reading "Understanding the 8 elements of TQM"
The role of a black belt in Six Sigma is for individuals who know the knowledge of the Six Sigma philosophies. A person who is certified with a Black Belt has to be able to show team leadership and responsibilities while working in a management or non management position. You have to be educated on lean management and DMAIC to qualify for the Black Belt role. Being certified as a Six Sigma Black Belts will allow you to be responsible for helping employees meet their potential and their goals and will allow you to oversee projects responsible for the Six Sigma. When you are a Black Belt, many times you will work in a management position, but often times you will be asked to use your skills on certain issues. Continue reading "The role of Black belts in Six Sigma"
Single minute exchange of die (SMED) provides a rapid and efficient way to covert a manufacturing process from running a current product to running the next product in line. The rapid changeover to a new product is part of the lean manufacturing principle, Mura. Mura is aimed at improving the overall flow of production. Companies that have already implemented a lean manufacturing system should look into SMED as one of their tools. It helps to eliminate unnecessary waste within the company and it aims to improve customer satisfaction. The different with SMED and other lean tools is that it is focused on one small step in the entire manufacturing process, which differs from other concepts that look at is as a whole. Continue reading "Single minute exchange of die (SMED)"
If you are building a total quality environment, you need to establish some tools to measure your company's performance. TQM is focused on improving quality within every aspect of the organization. Some companies prefer to measure performance through the use of financial gains. This is a good way to get a number, but it fails to provide you with the quality of your businesses performance. Keeping up with customer demands can be frustrating for any business. One way to keep up with customer demands is to introduce a pull-production system. Pull-production works by corresponding the different departments together so a product can be made to fit the needs of the customer. Pull production systems save companies money because you do not keep inventory. Warehousing inventory not only costs you money on rent, it also takes away money from your cash-flow and ties it up until you sell the products in your inventory. Process improvement focuses on getting things right the first time you do them. Instead of waiting for variations and product mistakes, you will take steps to change the inputs so the outputs are correct. Typically process improvement will define the goals of the company to figure out what purposes your product serves. From here you will determine who your customers are and why you serve them. The last thing process improvement will uncover is how to align your business process to make production faster and speed up all the other systems within the company. Continue reading "Implementing process improvement roles"
Safety in the workplace should always be a high priority. Having accidents on the job can lead to a loss in productivity and can cost the company a lot of money. It can also have an effect on how your employees perform their work. If they do not feel as if they are in a safe environment, they will not perform to their best potential. Continue reading "Implementing behavior-based safety or a program to reduce accidents"
TQM or Total Quality Management is a great way to improve manufacturing processes and increase customer satisfaction. TQM goes one step further and it also helps to build teamwork within companies. The purpose of TQM believes that if you can fix the inputs of a manufacturing system, the outputs will be 10 times better and customer satisfaction will significantly improve. This will happen because you are removing wastes within the system. Continue reading "Using TQM to build teamwork"
In manufacturing OSHA is one of the federal agencies that are involved in determining the regulations that manufacturing business must follow. The majority of regulations that OSHA devises are regulations that are designed to protect the employees in the workplace. OSHA also institutes regulations that are designed to tell employees and their managers what should be done in certain situations. Continue reading "Regulations that are put in place by OSHA"
The manufacturing business is a multi-level structure. From the owner of a manufacturing business, to the owner of a manufacturing process, machine, or product, there are owners on every level of the manufacturing business. Here are a few different types of owners in the multi-level manufacturing structure and how they are interrelated. Manufacturing can be a dangerous profession. Heavy machinery, lots of moving parts, and other factors make it easy to get injured while on the job. This is bad not only for the employee who was injured, but can result in lawsuits and hefty fines for the company. As a manager, safety should be one of your top priorities. Ensuring safety in the workplace is a manager's responsibility. Continue reading "Making your manufacturing plant safer"
One of the biggest controversies in the current economy is if outsourcing your manufacturing has any kind of an effect on the economy. Some people believe that outsourcing your manufacturing is going to negatively affect the economy because it is taking jobs away from the economy. Those jobs could be given to other people, which could boost our current economy. Other people think that outsourcing your manufacturing is not affecting the economy because it is allowing manufacturing businesses to cut their costs, which means they are making a profit. If the manufacturing plant is making a profit that means they are going to stay in business so there will still be jobs available for people from this company. Continue reading "Does outsourcing your manufacturing affect the economy"
One of the things that you are going to have to face in any kind of workplace is confrontation. If you work with other people confrontation is going to be inevitable, which means that they are going to be pretty much impossible to avoid. But what you might not be thinking about is that there are numerous kinds of confrontations in the workplace that you can encounter and many times you can deal with them in the same way. Confrontations are basically when two employees come face to face to deal with a problem. But the thing is if you are a manager you are probably going to be dealing with more confrontations then the regular employees because you are going to have to deal with any management issues and that includes correcting the employees. Here are some tips to dealing with confrontations in the workplace. Continue reading "Dealing with confrontations in the workplace"
Decide what type of employee you need. Can you afford to hire one full-time employee or will it be cost-effective to hire two part-time employees? If you decide to split up the position, you may end up with one quality employee and another that is mediocre. Over time, you can promote the other employee to a full-time position if they look like they will be with the company long-term. The mediocre employee can be let go or they may end up quitting. Continue reading "Cutting costs not quality when hiring"
When it comes to hiring employees, it is important to find a reliable person you can trust that also has the experience needed to do the job correctly. Manufacturing in particular is a trade that must have hard working employees in order to do the job right. But finding and choosing hard working manufacturing employees can be difficult. The following are some tips to help you choose hard working manufacturing employees. Decide how you will fill the positions. There are a number of ways you can go about hiring the right hard working manufacturing employees. You can offer the job to people you already know, such as family members or friends. This is common with small businesses or businesses that require a skilled trade, such as manufacturing. Continue reading "Choosing hard working manufacturing employees"
Continue reading "How to avoid accident or injury in the plant"
How to reduce repetitive motion injuries on the line is a subject that is relevant to both workers and managers. Injuries reduce productivity and increases costs. You must be careful and mindful of these injuries if you work on the line or if you are managing the line. A lot of the methods you need to use to avoid repetition really depend on the job you are working. A person working an assembly line will have a very different job than you if you work at a desk. Hence, their repetitive motions could be a twisting motion and yours may be the typing motion. Hence, apply the following suggestions to your particular job as best as possible. Sit up and back in your chair to get the most support possible from the chair. Check with your employer to get a good ergonomic chair. An ergonomic chair will adjust in a variety of ways to support your body as much as possible. The chair will help you maintain a good posture throughout the day. This will be your most effective step to prevent repetitive injury if you are sitting down on the job. Continue reading "How to reduce repetitive motion injuries on the line"
There are a lot of different things that can cause your company money. One thing that can cause your company money is employees. Employees are an essential part of most companies especially manufacturing companies. But if your employees have a lot of accidents and injury it may end up costing your company too much. Here are some tips to help in reducing accidents and injury at work. The first tip is to make sure that the work area is clean. If you run a manufacturing company and your machines have scheduled down time you will want to make sure to take advantage of this time. You can do this by having your employees go around and pick up their area. If there is a lot of debris that gets on the floor you may also want to include sweeping. This will help your employees not trip over things and have the chance of falling. The second tip is to have your employees clean up their stations before and after their shift. You may want to have them shut down their machines ten or fifteen minutes early so that they have time to clean up their work area. This will help to have all of the tools put in the right place. This will help prevent accidents from having to walk around and look for certain tools that may not be in the right spot. Continue reading "Reducing accidents and injury at work"
There are a lot of different things that one has to worry about in the workplace. You have to worry about if you are doing your work right and if you are working hard enough. Some people even have to worry about a bilingual workplace. If you are one that works in a bilingual workplace and want to feel more comfortable, here are some tips on making a bilingual workplace more comfortable. The first tip is to learn some of the common words and phrases that people use in other languages. This will help you to at least get the idea of what they need or even what type of information you need. You may also want to make sure that you know things in different languages that pertain to your job. This can be helpful if some one in your workplace needs something or even if you need to find out for more information from them. Continue reading "Making a bilingual workplace more comfortable"
Trying to find the best employees for your manufacturing plant can sometimes be difficult task. After all, you want the plant to be efficient which means you must find and hire the best employees and keep them around to do the job. Hiring and retaining manufacturing plant employees can sometimes be like finding the right roommate and when they leave it has a rippling effect on the rest of the organization. It creates unbalance, and that can cost you money. . Here are some tips on hiring and retaining manufacturing plant employees. What are you getting into?This is an important question to ask yourself, as hiring employees takes a lot of preparation. Do you want or need to hire full or part time employees? Do you need independent contractors? Do you want to outsource? These are all important questions to ask yourself. Continue reading "Hiring and retaining manufacturing plant employees"
The Six Sigma process has caught fire with many top companies such as AlliedSignal, GE and Motorola. It is a process that involves a lot of time and a lot of manpower in order to achieve results. Successful implementation is done on a project-by-project basis and will result in continuous improvement of processes. Successful implementation also depends on many factors like the company's culture and the commitment and conviction of its leadership. Without these factors, the Six Sigma process can fail, however successful implementation into your manufacturing business is not as hard as it seems. Below you will find some steps for successful implementation. If this is the first process improvement program you have implemented to your company; it may be a little challenging. Organizing the process and having commitment from everyone involved is not always simple. Many times companies find themselves trying new strategies so often that employees don't take them seriously and are resistant to change. This is why the leaders of the process highly influence the company culture. The leaders need to buy in and commit themselves to Six Sigma and their examples will trickle down to everyone in the organization. Continue reading "How to implement six sigma policies into your manufacturing business"
In a world with an increasing number of lawsuits, executives in the manufacturing field are looking for ways to better regulate and enforce safety rules in the work place. While as executives you can try to implement these regulations upon your employees, working with your employees for a safer manufacturing plant will be more beneficial for the company as well as for the employees themselves. The most important aspect in creating a safer manufacturing plant is knowing what the regulations and safety standards are. As executives, it is crucial that you study (perhaps with legal counsel) government regulations on your specific type of manufacturing. Determine if there are further regulations that would benefit your company. Discuss how you can best utilize your budget to implement the regulations and safety standards. Recognize ways you can involve your employees in helping to make a safer work environment as well as how you can motivate them to improve safety in the manufacturing plant. Continue reading "Working with your employees for a safer manufacturing plant"
It does not matter where you work or what line of work you are in, accident can and will always happen at some point in time. Most of the accidents that happen in the work place can be avoided through some safety training and implementation. Working with employees to improve manufacturing safety is a necessary part of the job. Most safety rules are not followed because they are easy to ignore, and employees feel that the rules don't apply to them. Simple things such as wearing safety glasses, or a helmet while on the job are rules that need to be given strict head. Here are some suggestions to working with employees to improve the safety in your manufacturing plant. An easy and great way to improve the safety of your employees in manufacturing is to reward those who are following the safety rules. It may sound a bit juvenile, but it seems to work. Just as children love to be rewarded when they do something good, so do adults. More often than not we focus our attention on those who are not following safety procedures and rules and have many forms of punishment for their behavior. What about those who are following the rules? Where is their reward? Just like our peers, it is the employees that set the standard for behavior, and if you can capitalize on those following the safety rules, the other employees may begin to see that and change on their own. Continue reading "Working with employees to improve manufacturing safety"
The United States of America has and continues to grow immensely. It is a land of opportunity and a chance to live the American Dream for everyone. English being the native language, but most definitely not the only one. Eighteen percent of the United States population is comprised of individuals who speak another language besides English. One in every 2 people added to the nation's population (between the years 2003 and 2004) were Hispanic. It does not matter where you live, work, or play you will most likely run into people who speak another language. This is especially true when it comes to your work place. Your chance of working with, or for someone who does not speak English grows larger every day. As a business it is important to stay ahead of the competition; this is why manufacturing plants need bilingual employees. With so many different manufacturing plants, it is important to keep your edge on the competition and perhaps even gain a bit of an advantage. With such a high percentage of the population speaking Spanish or another language you might think that all manufacturing plants have bilingual employees; but they do not. It is to your advantage to do this. Some of the errors that occur happen because there are misunderstandings or misinterpretations in the lines of communication. Someone usually is asked to do something but with language barriers there was a misinterpretation. Anything can happen from that whether it is big or small. Problems like this are less likely to happen when you have bilingual employees in your manufacturing plant. Continue reading "Why manufacturing plants need bilingual employees"
Here are some great training tips for employees in manufacturing. Training manufacturing employees is easier, when you have a plan in mind. The plan can be something made from scratch. Or you can learn and implement a plan of management that other companies have already implemented. Continue reading "Training tips for employees in manufacturing"
One thing that you need to think about when it comes to your work environment is that as times change the chances of being confronted by non-English speaking customers or potential employees is growing higher. In fact you would probably be surprised to know that over fourteen percent of the current population in the United States actually speaks Spanish, which in our country is actually a pretty high amount, and that doesn't even include the customers that speak other languages. So in order to stay in business and to actually continue to do business in the United States you are going to need to have a bilingual work environment sooner or later. This is particularly important if you want to stay ahead of the competition and perhaps gain an advantage. But another reason why this is important is that more and more people who are getting hired speak English as a second language, so if you have a bilingual work environment people will be able to communicate with each other which means the jobs will get done properly.. Here are some reasons why it is important to have a bilingual work environment. Continue reading "The benefits of a bilingual work environment"
Waste in a manufacturing plant is the number one source of revenue loss. Of course, companies cannot just "eat" the cost of waste so the cost is passed onto the customers in a lose-lose situation. Toyota has developed some standards of "lean manufacturing" which you might use to reduce waste in your manufacturing plant. To impart the principles of lean manufacturing to your employees, you should probably send at least the department heads to a seminar or conference that features the principles of lean manufacturing. Those employees who attend the seminars can form a training committee and bring the training home to the base level employees in your company. Continue reading "How to better train your employees on lean manufacturing standards"
Manufacturing jobs are interesting in that although manufacturing jobs are often described as difficult to find, manufacturing turnover rates are among the highest. It typically takes about a month to fill a vacant position in the manufacturing industry. So, the combination of potential employees not knowing where to look and the manufacturing industry not knowing where to post their job openings is a real concern. 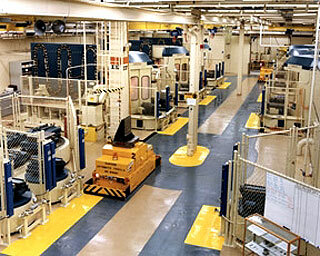 Manufacturers are anxious to keep their plant floor staffed in order to maximize their efficiency. Over recent years, production in the United States has become more oriented towards what are called "non-traded" goods. Non-traded goods include such goods as residential housing investment and commercial construction. Because the consumer is moving away from the traded goods industry, of which manufacturing plays a vital role, the manufacturing industry is suffering and is looking to improve their work force in order to remain competitive and retain their standing as the supplier of roughly three-quarters of all U.S. goods traded. Continue reading "Where to post openings for manufacturing jobs"
	It typically takes about a month to fill a vacant position in the manufacturing industry. 	On average each vacancy attracted fewer than three applicants. The wage of the job, the area of the job and the unemployment rates of the respective areas were factors. 	After being interviewed, the decision to make an offer to an applicant was based more on impressions made in the interview or references rather than on employment histories. 	Turnover costs (costs associated with terminating or having to replace employees) account for between 5 and 10 percent of total wage costs. 	Higher wages reduce the likelihood that an employee would leave the plant. On average, higher wages lead to higher levels of employment. 	Those who leave a company in this particular sector of the market are likely to be young, well-qualified and single. 	Job satisfaction levels of employees who choose to leave a manufacturing company are similar to those of people who stay. Continue reading "How to retain employees at your manufacturing plant"